What with being pregnant, having a baby, etc, etc, I haven't been keeping up with the yardwork. Then, with all the rain, it became quite a jungle in the back yard. The positive is, our soil is really good, so everything just goes nuts. 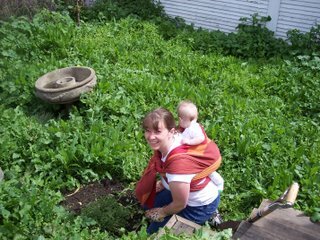 Just before Cary was born (actually, the day before), my mom and I cleared out the yard, taking out tomato plants that had run amok. Underneath the giant tomato plants were some sad little decomposing stakes that I had tried to use to keep them up. Yeah, shoulda gotten those tomato frames. Anyway, after we did all that work, 4 months of neglect brought back a disastrous amount of weeds. Among the weeds were some lettuce plants that came up all by themselves ( I let the lettuce I planted last year go to seed, and it was all over the yard!). Having lettuce all over the place was cool for a while, but soon, the other weeds had overtaken it. Yes, all that green stuff is weeds. Yikes! It's all cleared out now, and since the rain let up today, I planted some lettuce, spinach, summer squash and cucumbers. I wish I had pictures of the cleaned out yard, but I don't yet, and it's dark out now. 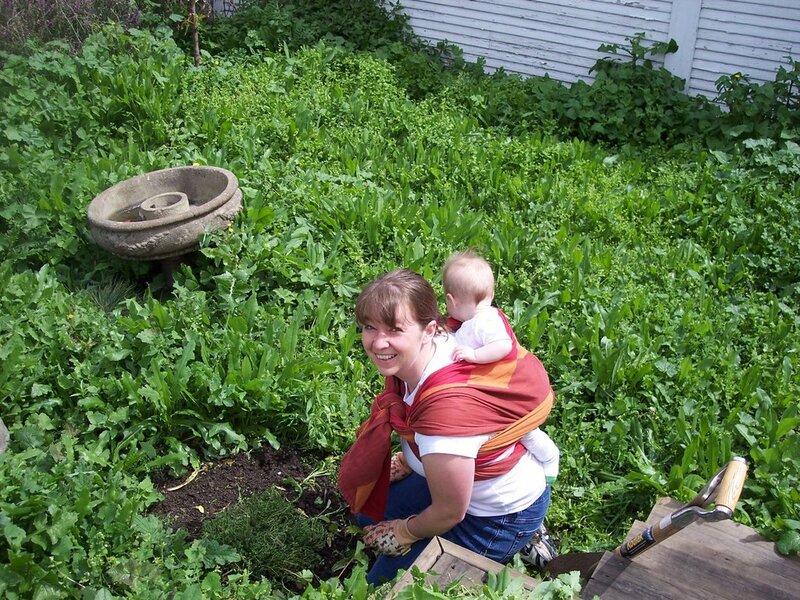 Cary likes hanging out on my back while I garden. It works for a short period of time, after 15 minutes or so, she gets antsy, but that's something. I hope I can keep up with the yardwork better now. We're going to try and get the yard more landscaped, and probably put down some material to stop the weeds. I really don't want the jungle to come back! Yay, new posts, new pictures and fun stuff! I particularly enjoyed the 'evil incarnate' one! Hey, do me a favor and ask Erick how the restoration is coming. Perhaps I should give him a call?